Beef, water, salt, spices, celery juice powder, sugar, garlic powder, onion powder. The first thing that hits my tongue is a light salt, with a light garlic and onion seasoning. Notes of black pepper can be detected. The chewing brings on more of the garlic and onion with an increased salt. The black pepper becomes a little more noticeable too. There's some light natural meat flavor that comes in late. For being marketed as "Black Pepper", it stands up in terms of flavor and in the copious amounts of ground black pepper seen on each piece. The black pepper is well noticed, but doesn't overwhelm. It's only lightly spicy in term of burn. Othewise, the primary taste profile is the salt and garlic/onion seasoning. 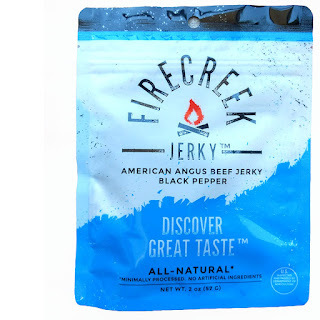 The black pepper takes a close second in terms of influence, while the natural meat flavors linger lightly in the background. The meat consistency seems overall good. It's tender, easy to chew, quite flexible in handling. The pieces break down quickly in the chewing, almost crumbly. They don't really feel like pieces of steak, but do offer something "meaty". I didn't encounter any stringiness, nor fat, or other unchewable matter. 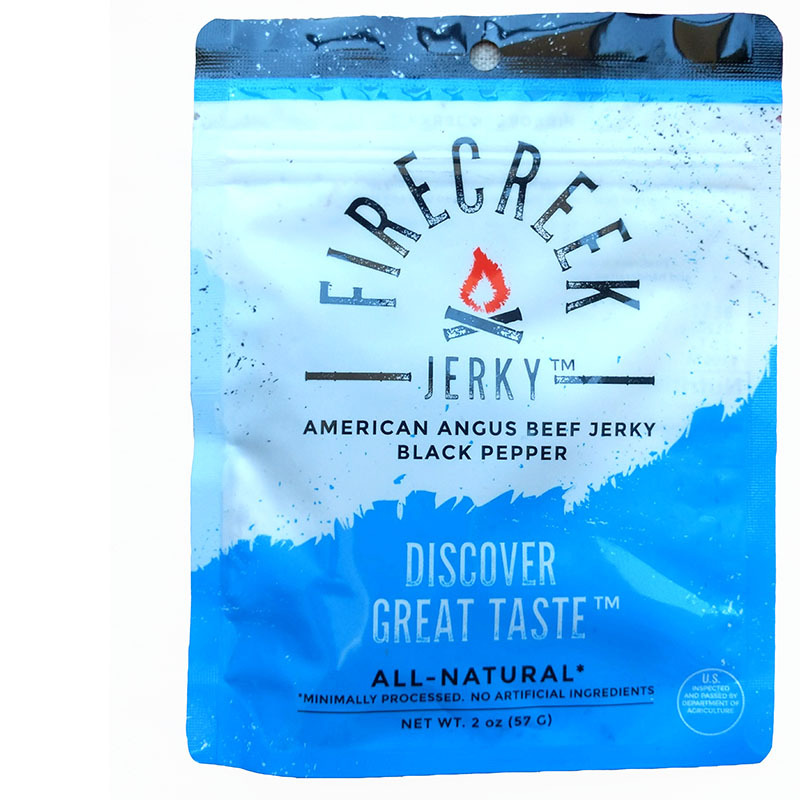 This Black Pepper from Firecreek Jerky delivers a good black pepper flavor without overwhelming the palate or scorching the tongue. 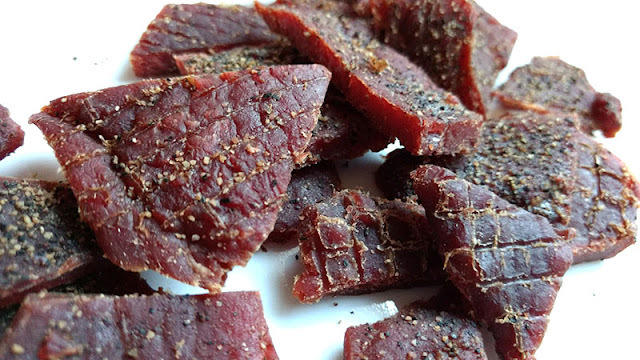 It's only lightly spicy, and perhaps good for folks who like a little extra pepper on their meat snacks. Otherwise, it's pretty much like the company's Original variety, mostly a salty flavor with colors of garlic and onion. 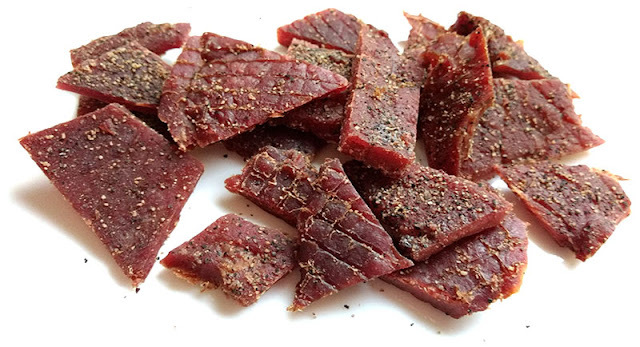 But like the Original, it's hard to really find something new, different, or outside the box with this jerky. It's great that it's all natural, minimally processed, but so are many other brands we've reviewed. I do like the tender, easier chew, however. But, the saltiness tends to wear me out.